Prime Minister Narendra Modi and Prime Minister Japan Shinzo Abe today talked about Hussain Entertainment Center, located in the foot of Mount Fuji. And visited industrial robots producers. This was the first day of Prime Minister Modi’s two-day peak conference. As a result of this peak conference, there has been a lot of excitement in mutual relations. Narendra Modi arrived in Japan last evening, so that he was 13th. Japan can attend annual peak conference. He said that the partnership between the two countries is going through a radical change primarily and relations between the two countries have become stable. In particular, defense and global partnership sectors have significantly increased relations between the two countries. The two-day peak conference was started today, in which the bilateral cooperation between mutual relations and defense cooperation will be reviewed. Modi’s Shinzo Abe warmly welcomed Hotel Mount Fuji on his arrival. In the background, the scenic center of beautiful scenes in the west of Tokyo lies in Yamanashi. Meeting this natural beautiful center in Yamanashi from Prime Minister Shinzo Abe is unmatched. Narendra Modi wrote on his Twitter that both the leaders will talk about deepening mutual relations. Both the leaders walked beautiful scenes and then Modi attended the invitation organized by Shinzo Abe. Modi said that after some obstacles, both the leaders visited the industrial robbery factory after the launch. Talking about developing mutual cooperation with modern and advanced technology, the Ministers of the two countries visited the financing corporation. The industrial robot is a large-scale manufacturing company. The two ministers also visited automated car parks. A spokesman for the Foreign Ministry, Ravish Kumar, wrote on his Twitter that Prime Minister Japan has set an episode in his personal Place on the banks of a lake in the honor of Prime Minister Modi. This is the first time, while Prime Minister Japan has invited a foreign political leader. In September last year, Modi had hosted Prime Minister Japan’s own native state in Gujarat. 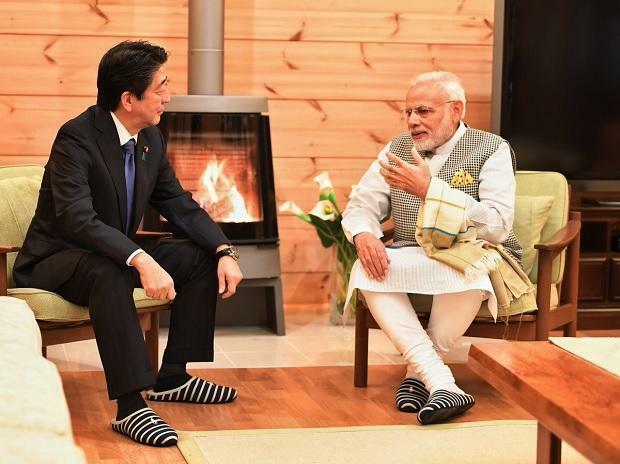 Talking to the volcano, Prime Minister Japan Shinzo Abe hosted Prime Minister Modi on his personal Place. After the drug, both the leaders departed to Tokyo via the train.